​Whether you’re looking to buy custom t-shirts from the shop or you’re planning to set up a t-shirt printing business, there are two types of printings you definitely should know about – screen printing and heat pressing. These are the two main methods of printing t-shirts, and they have different costs, quality, the flexibility of designs, and so on. Today, we’re going to break them down, so you’re totally sure of what you’re dealing with. Screen printing is the oldest method of printing garments, with its roots going back as far as the ancient world. As early as 2500 BC, the ancient Egyptians were already practicing the art of stenciling, and the practice later spread to Greece and China, where silk was used to make the screens. Colorful minerals, berries, roots, and other natural dyes were used as the inks. Heat transfer printing, on the other hand, did not start until the 1940s. It was invented by a company known as SATO, but the heat press machine was only invented in the 80s. One quick note: screen printing produces better quality printings than heat transfer. With that being said, let’s look at the pros and cons of each of these methods. In screen printing, otherwise known as silk screening, actual screens are used. These screens are cut to produce stencils for the design, and after that, ink is spread over the screens. The ink passes through the screens right down to the item that’s being printed. You can only apply one color with each screen, so whatever number of colors your design is going to have, that’s the number of screens you’ll need. Heat transfer or heat pressing, on the other hand, involves the use of pressure and heat to apply custom designs to objects. There are several ways in which this can be done. You can either heat press vinyl (often colored) onto garments or heat press a digital print onto the apparels. 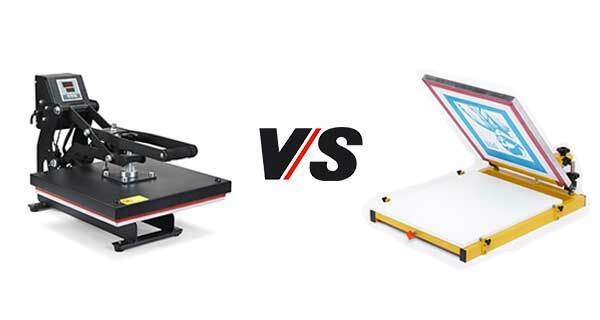 Apart from that, there are two main classes of heat presses – some folks use the iron, which is the cheaper method, and some use the heat press machine, which is more expensive but more effective. If you’re doing heat transfer using vinyl, then you’ll need a machine to make the cutouts. You’ll then use a heat press to transfer the colored vinyl pieces onto the item you’re printing. If you’re doing digital heat transfer, you’ll first print the graphic on a special paper, known as heat transfer paper, using a special ink called solvent ink. This special ink will allow you to transfer the design using a combination of heat and pressure. Once again, you can use an iron or a heat press machine, but we’d recommend the latter as it’s easier to set the right heat and pressure, and often produces better designs. With screen printing, individual screens have to prepared for each color. The problem is that prepping each screen takes time, but once the screens are prepared, the printing takes place efficiently. If you’re only printing a few t-shirts, you’ll find screen printing extremely time-consuming especially where many colors are involved but if you’re printing in bulk, say 500 or more t-shirts, screen-printing will be very time-efficient, especially where one or just a few colors are involved. The time you will take to so each heat transfer will remain the same especially if you’re using colored vinyl. In the event that you’re only printing a few garments, you will find this method more time-efficient than screen-printing but if you’re printing in bulk, say a hundred or more garments, you will find it too time-consuming. The cost effectiveness of each method depends on the number of apparels being printed. Screens are expensive to produce, but they are reusable. So, if you’re only printing a few garments, say 500 or fewer units, screen printing will not be the best method with regards to cost. If, however, you’re printing 500 or more t-shirts, screen printing will be very appropriate as the cost of each screen will be spread across the number of garments being printed. The bottom line is that screen printing is cost effective only when printing in bulk. With heat transfer, the cost stays constant, as the cost of the vinyl essentially stays the same. And again, the vinyl that’s used on one apparel cannot be used on another apparel. But if you’re doing digital heat transfer, you might be able to reuse transfer papers and thus reduce the cost as you print more garments. All in all, with cost efficiency in mind, heat transfer is often suited for small runs rather than long runs. Are you a buyer wondering which one between screen-printed and heat-pressed t-shirts are less expensive? Well, it depends on the number of t-shirts you’re looking to purchase, and of course, you’ll have to consider the manufacturer’s cost of production. Think of it this way – if the manufacturer is using screen printing, the more the t-shirts, the less the cost, but with heat transfer, the fewer the t-shirts, the less the cost. So, if you’re only buying a few t-shirts, it would be cheaper to buy heat-pressed ones, but if you’re buying in bulk, you’d better buy screen-printed t-shirts if you want to save some cash. Screens are normally not so huge; they’re typically only big enough to cover t-shirts. When it comes to huge items like tablecloths, screens might be a little too small unless you’re placing small printings. Conversely, there are large, industrial-size heat press machines that allow you to print huge graphics that can even fill a tablecloth. 1. How much can I charge for my screen-printed t-shirts? For a 100-percent cotton shirt printed with one color, the average price is five to nine dollars. Of course, the more the colors, the higher the cost. 2. Which one between screen printing and digital printing is better? Digital printing might be faster, but when it comes to the quality of the designs, screen printing is a lot better. How so? The ink applied to a screen printing is thicker, and the colors come out brightly even when you’re printing on dark apparels. Moreover, screen printed designs are more durable than heat pressed ones. Those, our friends, are the differences between screen printing and heat pressing. The main point is that when you’re dealing with large orders, of 500 or more units, screen printing is the more appropriate method, but when dealing with small orders, heat pressing is more suitable. Again, heat pressing makes it easier to create multiple-colored designs because, with screen printing, a separate screen has to be made for each color. >> What To Look Before Buying Vinyl Cutter For T-Shirt?